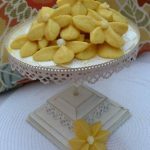 Lemon Blossom Cookies are shortbread cookies made with lemon dry gelatin and shaped into spring flowers. 1. Cream butter, sugar, extract, gelatin powder and egg in large mixing bowl of electric mixer on medium speed. On low speed, gradually add flour. Beat until mixture leaves the sides of the bowl. Shape dough into 1 ¼ inch balls. Cover and refrigerate one hour or overnight. 2. Heat oven to 375 F. Place balls on parchment lined baking sheet 2 inches apart. With sharp knife, make 5-6 cuts in top of each ball about three-fourths of the way through to make 6 petals. Shape wedges with fingers and place each wedge together to form a flower. Make sure center of flower is closed. Refrigerate 20 minutes to set shape. 3. Bake 9-11 minutes or until set and edges begin to brown. Do not over bake. Cool 3-5 minutes. Remove from baking sheet to cooling rack. Cool completely before frosting. Fill pastry bag or zip lock baggie with frosting, clip 1/8 inch corner and pipe centers. Cookies can be frozen before frosting.